Cambridge Public Schools » Departments » Facilities Management » Sustainability » PFEWG Model for Sustainability » Food: It is the “F” in PFEWG! The Cambridge Public School Department is committed to serving healthy, nutritious, and environmentally sustainable food, and is committed to implementing sustainable food service practices for our students and staff. Specifically, we are trying to bring in locally grown, organic, nutritious, and delicious food, compostable bioware such as biodegradable trays and plates, and full-scale recycling and composting in every cafeteria, as well as reducing our packaging. Currently, we are introducing compostable bioware in our school cafeterias in partnership with our schools’ Food Services Department. We hope to expand this initiative, and to be able to offer biodegradable products that can be placed into composting containers in all of our cafeterias. We are recycling in every cafeteria, and have composting programs in nearly all of our schools. We hope to expand our composting programs, run in partnership with the Department of Public Works, to every school. Starting in the late 1990s, the Healthy Children Task Force (HCTF), a Cambridge community-based coalition devoted to promoting children’s health in the City of Cambridge, has been a national leader in healthy weight promotion. Brought together by the HCTF, a diverse team of public health professionals, civic leaders and city agencies, academics, parent activists, and the Cambridge Public Schools have been working together to develop innovative approaches to physical activity, offering healthier and locally-grown foods in its school meals program, producing health and fitness progress reports, establishing school gardens in all elementary schools, and developing model school nutrition and wellness policies. The CPS Office for Sustainability supports public health programs in the school, as many programs are directly linked or associated with environmental sustainability. Currently, the Tasty Choices Program, a partnership between the Cambridge Public Health Department School Health Program and the schools’ Food Services Department, is an essential part of the ongoing work to help students stay healthy and in school so that they can reach their academic potential. Through this program, school nutrition staff collaborate with the schools’ Food Services Department to increase the number of healthy and appealing food choices available to students. Nutrition staff work to create a school environment that promotes healthy choices throughout the school day, as well as provide education and outreach to students, staff and families. As part of the Tasty Choices Program, the Farm to School Program, started by the Growing Healthy Collaborative, is bringing locally-grown food into the school cafeterias, including nectarines, cider, apples, peaches, tomatoes, butternut squash, carrots, and pickles. Additionally, in February 2011, Cambridge officially signed on to First Lady Michelle Obama’s national campaign to end childhood obesity, entitled, “Let’s Move. Locally, this campaign is being directed out of the Cambridge Public Health Department and helps to raise awareness about childhood obesity and inspire families, schools and communities to take action to help kids be more active, eat better and get healthy. 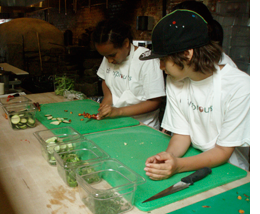 CitySprouts is a Cambridge-based nonprofit that is currently working in all of our schools. There is a garden in every school thanks to this partnership, and CitySprouts introduces school gardens as a core element of children’s public school education. The gardens ensure that hands-on learning, environmental stewardship, and the physical & sensory experience of growing and eating food becomes part of our students’ public education.